Good and cheap? The Pavilion g6-1352eg is particularly striking due to its attractive price. 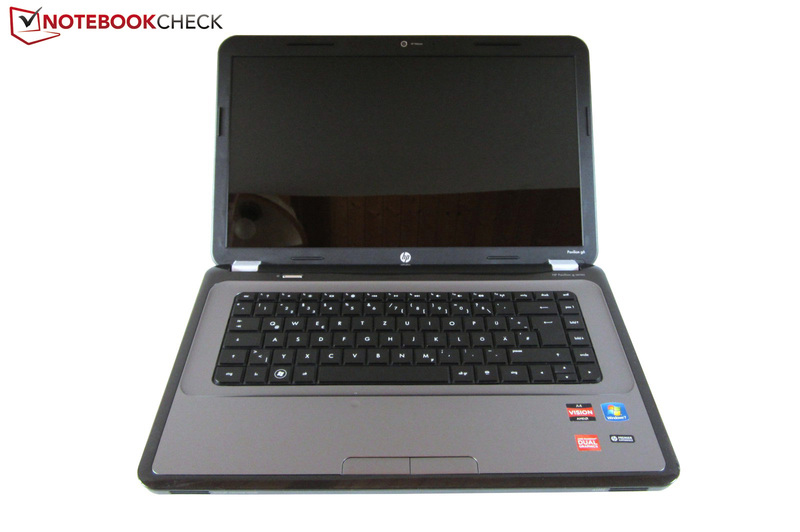 HP manufactures a 15 inch multimedia device for EUR 500 that has two graphics cards (CrossFire) in addition to a dual core CPU right away. Is the AMD hardware a match for the Intel and Nvidia competition? 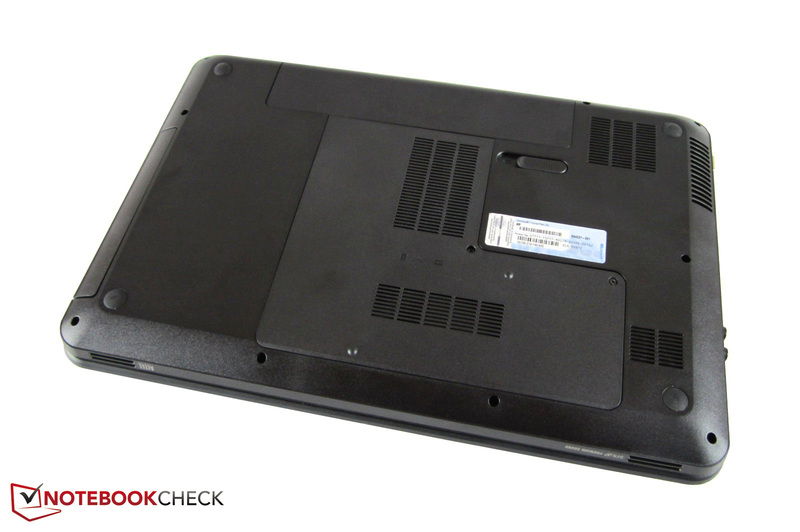 We recently took a closer look at the 17 inch Pavilion g7-1353eg. 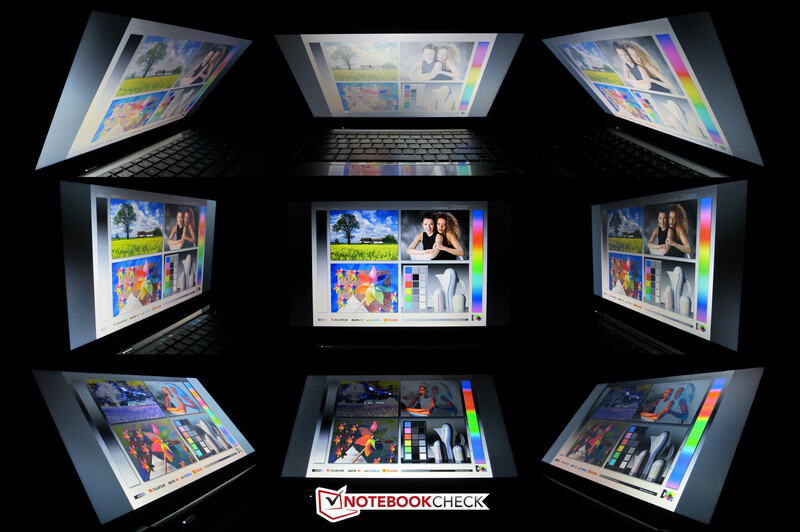 Now, the 15 inch version of the affordable multimedia notebook faces our tests. 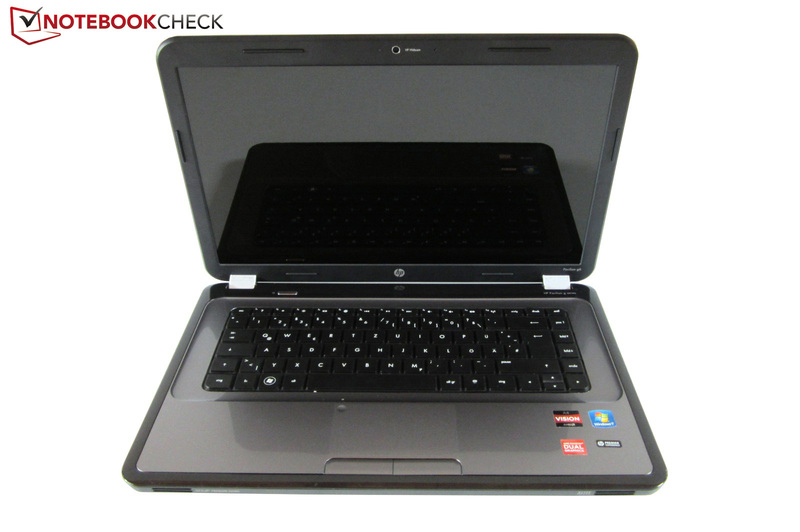 It's not very surprising that HP has the Pavilion g6-1300 available in several versions. For example, we find Intel-based devices that are equipped with either a Pentium B960 (2.2 GHz, 2 MB L3 cache) or a Core i5-2450M (2.5-3.1 GHz, 3 MB L3 cache). 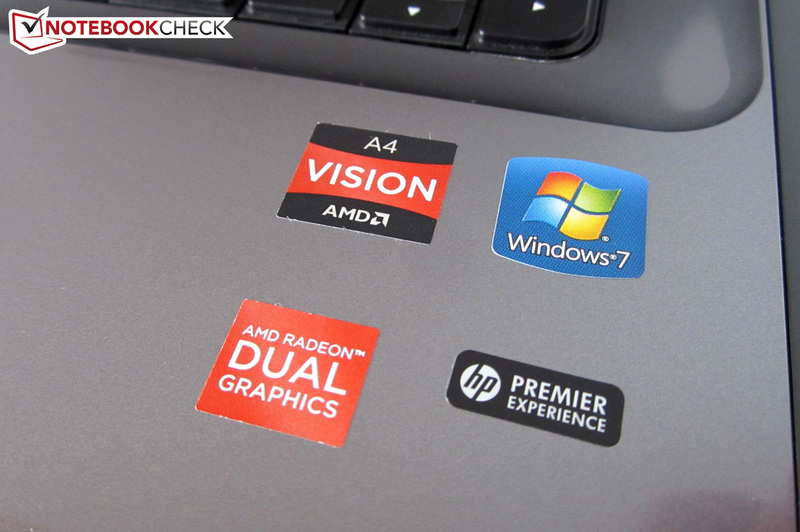 Beyond that, a few AMD devices are also available. 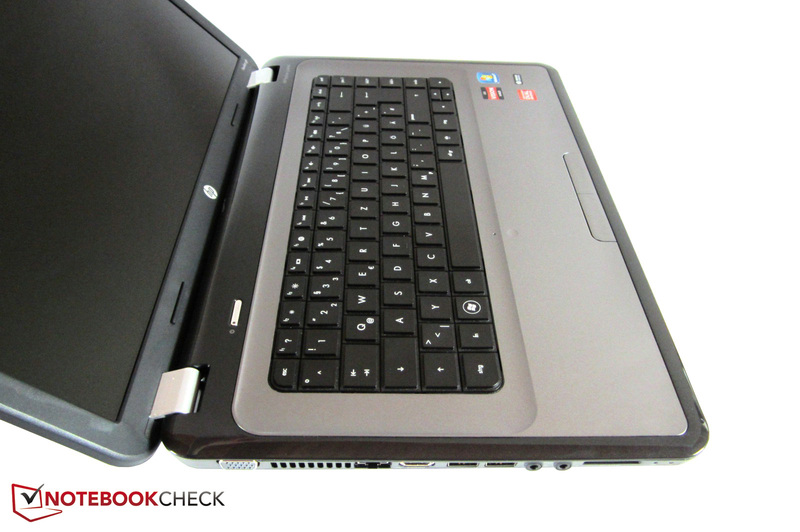 They aren't quite as expensive and feature the dual core A4-3305M (1.9 GHz, 1 MB L2 cache). There are also differences found in the graphics card configuration: While some models have to be satisfied with Intel's HD Graphics 3000, other models are accelerated by the Radeon HD 7450M and/or the Radeon HD 6480G. The hard disk capacity ranges from 320 to 640 GB and that of the main memory is either four or six GB. They all have the operating system (Windows 7 Home Premium 64 bit), optical drive (DVD burner) and screen (1366x768, glare) in common. 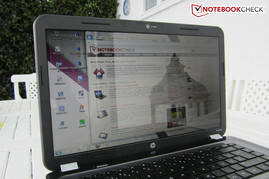 We opted for one of the lower priced alternatives with the Pavilion g6-1352 (RRP: EUR 499) and put it through its paces. 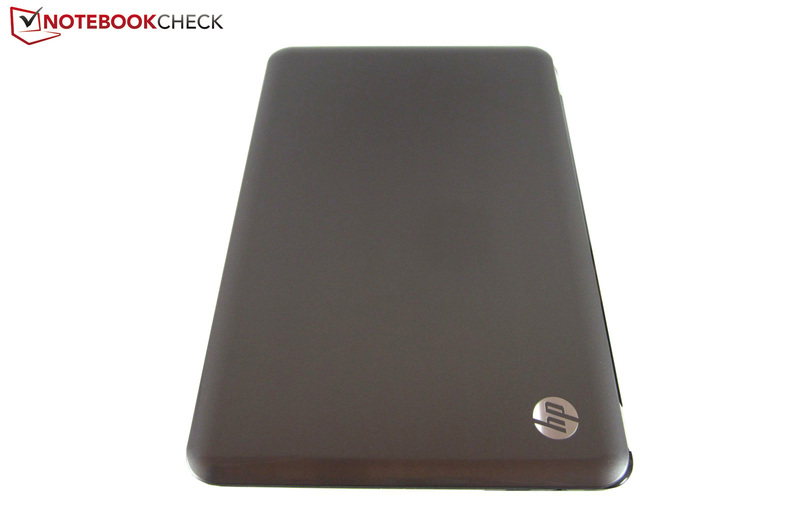 Like its bigger brother, the Pavilion g7, the case makes a good impression. The rounded shape and the charcoal gray surfaces (lid & keyboard bezel) give it a unique look. The high-gloss finish is definitely a matter of taste; we would have preferred a matt finish because of the high (smudge) susceptibility. 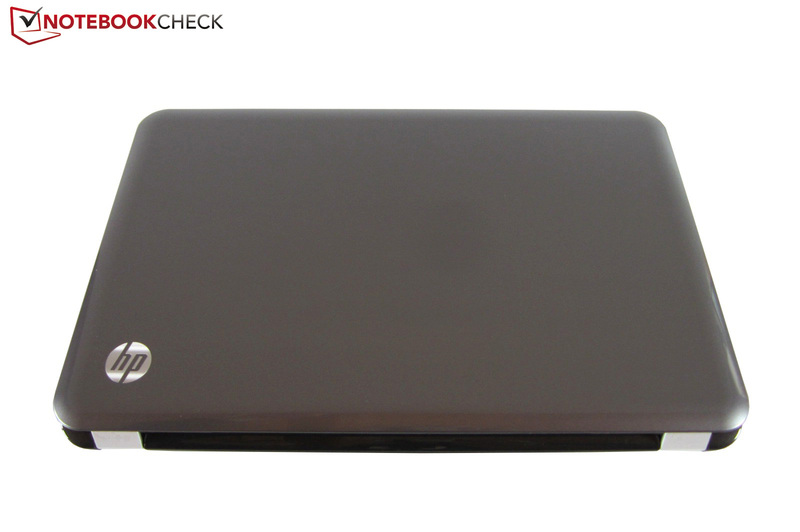 The buyer shouldn't expect too much from the notebook's quality because HP only uses plastic. Although a few components aren't quite flush (e. g. the transition between the lid and display bezel), we deem the workmanship to be acceptable. The stability is also all right, with exception of the somewhat wobbly lid. The top can be depressed in several places, but the bottom hardly yields. Another advantage: The 15 inch laptop can be carried around conveniently thanks to the moderate weight (~2.4 kg) and the moderate dimensions (374 x 245 x 36 mm). Meanwhile, the metal-like hinges have room for improvement. Although they are pulled fairly tight (the base unit lifts evidently when the device is opened), surface vibrations cause the display to teeter. However, it should be possible to ignore that in view of the laptop's price. Overall, the case quality is located in the midfield. The ports are absolutely identical with the ones on the Pavilion g7. While the front and rear don't have any interfaces, the right harbors a Kensington lock, a USB 2.0 port and the power socket. The left is dominated by the number 2: Two video outs (VGA + HDMI), two USB 2.0 ports and two audio jacks (headphone + microphone). A card reader and an RJ45 Fast Ethernet LAN port finish the side off. It's too bad that there is no USB 3.0, FireWire or eSATA. 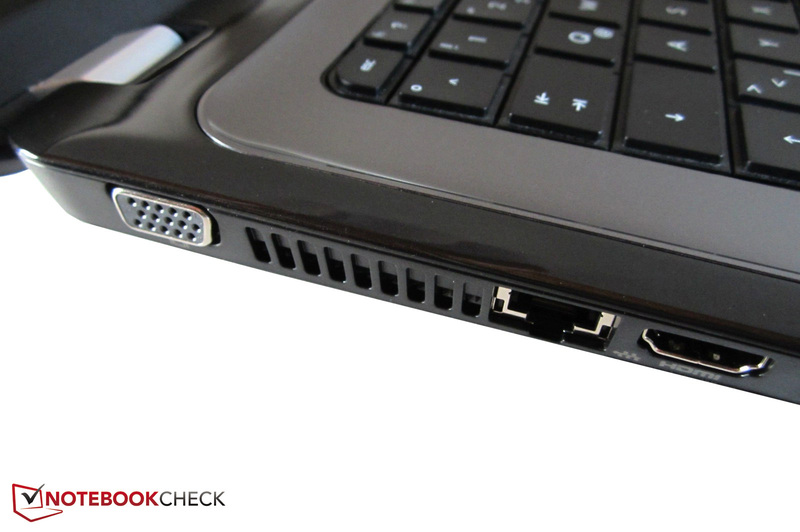 Although a few ports are placed (too) far front, we find the interface distribution good. Users who want to limit the cable mess to the greatest possible extent can also surf on the Internet via WLAN. The installed wireless module (Realtek RTL8188CE) can deal with the most important WLAN standards. HP doesn't include Bluetooth. As expected, only the wireless module, the RAM and the hard disk are accessible. 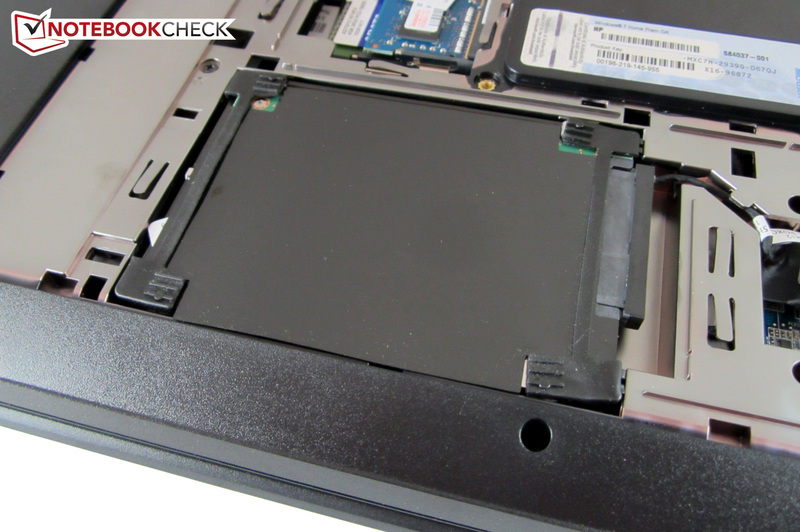 After removing two screws, the cover on the bottom can be taken off quite easily. The notebook has to be completely disassembled to clean the fan (whereby the warranty will likely be void). HP should have made cutbacks on the software rather than interfaces. Like many contenders, the manufacturer installs a lot of (superfluous) programs. The user should delete the one or other application to put a stop to pestering pop-up messages and allow the system to develop its full potential. The system backup is on its own hard disk partition and can optionally be burnt on DVDs. Apart from the battery and power adapter, the Pavilion g6 doesn't come with many supplies. HP only gives the user a quick start guide - not much. 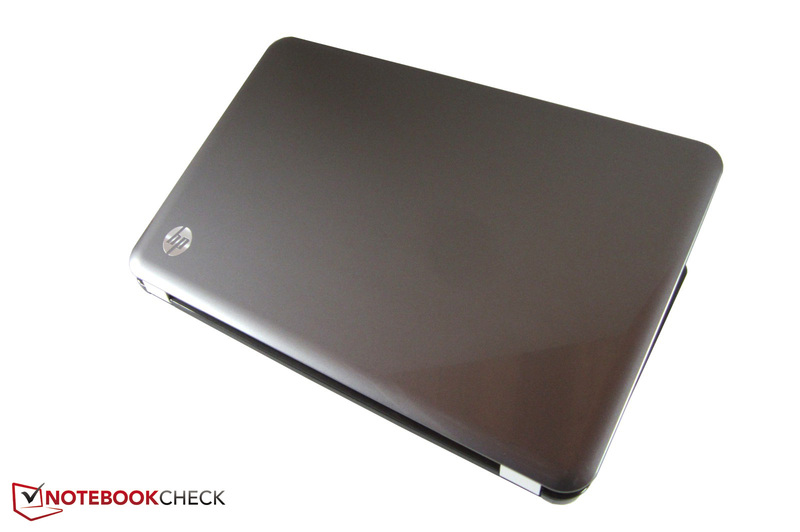 In contrast to the more expensive notebook ranges, such as the Envy 17, HP only grants a 12 month warranty (pick-up and return). If that isn't enough: The warranty can be extended, for example to three years, for a surcharge. The keyboard unfortunately isn't a sensation. On the con side, there is not only the missing number pad, which the bigger g7 sports, but also the cheap-sounding typing noise and the rather spongy stroke. The short key drop and the angular key shape don't impress us either. 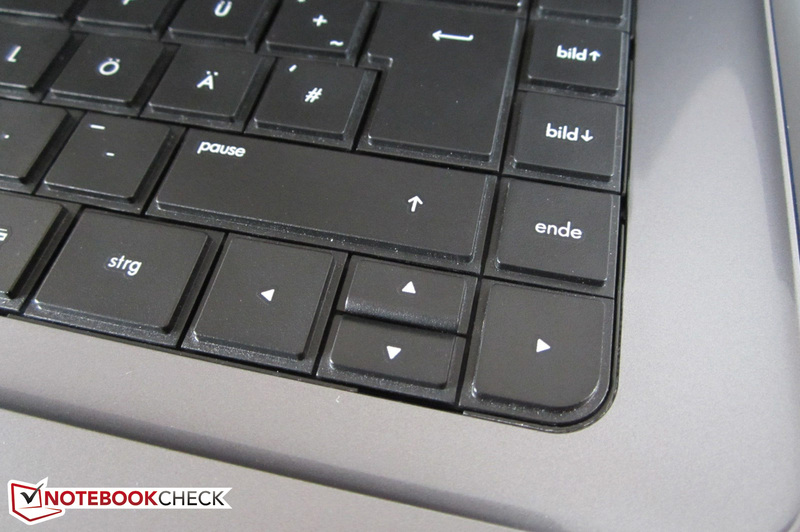 We often hit the wrong key despite the beveled edges. Perhaps it will become easier to cope with the design after a longer period of adjustment. On the other hand, the layout doesn't give as much reason for complaint. HP basically sticks to the standard. Moreover, the multitude of special functions is praiseworthy: The WLAN module, brightness and volume can be controlled via the FN row, among other things. The key size of 15x15 millimeters is average. The 90x49 millimeter sized touchpad can reap in a higher score. Although, the dotted surface texture (which can get unpleasant after longer use) has a negative impact on the gliding traits, the feedback is outstanding. The first-rate accuracy, the generally reliable gestures (multi-touch) and the optional scroll bar are further advantages. 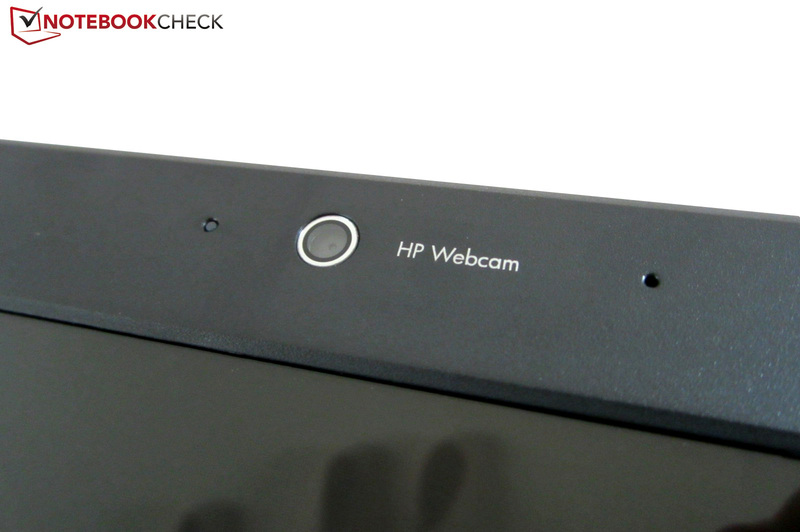 The small recess in the upper left corner that can be seen on our picture is for disabling the touchpad. Not everyone will like the touchpad's positioning. 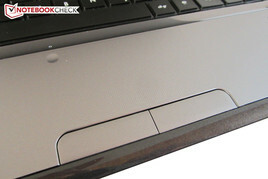 Unlike most devices, the touchpad is not centered below the space bar, but is slightly shifted to the right. This may be adverse for some, but it's sooner a gain for others (no accidental inputs). It quickly becomes obvious that HP relies on the usual standard fare when looking at the screen. 1366x768 pixels are common in the 15 inch range and just right due to the weak graphics performance. 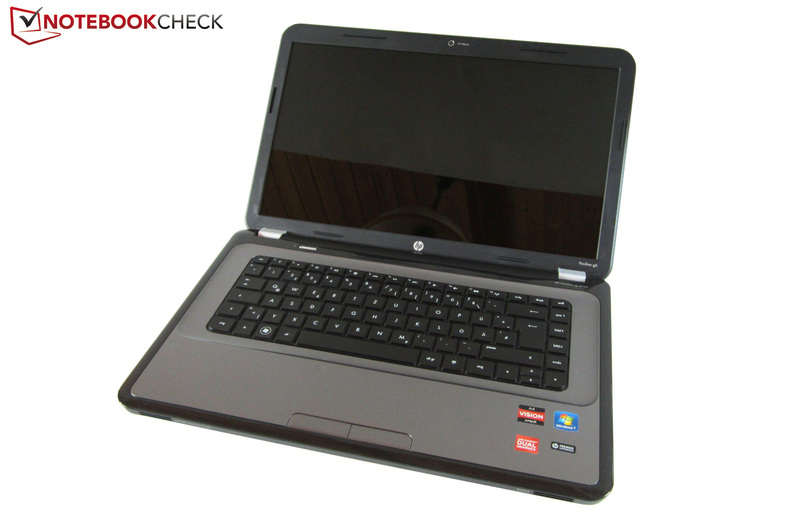 However, users who do a lot of computer work or are frequently multitasking should prefer a notebook with HD+ (1600x900), such as the previously tested HP g7, or a Full HD screen (1920x1080). But back to topic: To say it carefully, users shouldn't have any high expectations on the image quality. The 15.6 inch glare screen with an LED backlight from LG Philips (LP156WH4-TLC1) shows various shortcomings in practical use. We'll start with the brightness. Like the recently tested Pavilion g7-1353eg, the screen isn't particularly bright - 185 cd/m2 is a bit below notebook average (190-220 cd/m2). The brightness will suffice as long as it's used indoors, though. In our opinion, the high black value is a more severe drawback. While most notebooks achieve a black value of about 1.0 cd/m2, our meter recorded just under 1.5 cd/m2 in the Pavilion g6-1352eg. Dark video and game scenes are consequently rendered very grayish. The contrast also disappoints all the way down the line: 129:1 is extremely low. The colors look relatively pale and not even the sRGB space is covered properly. In short: Users who want crisp colors should use an external monitor if possible. Another drawback is the screen's extreme susceptibility for reflections. Depending on the location, the user has to live with annoying reflections in the daytime even indoors. It's also possible that almost nothing can be seen on the display outdoors. A higher brightness and/or a matt screen surface would lessen this problem. There is also room for improvement in the viewing angles. Users will be faced with obvious changes in brightness when looking at the screen from a slightly slanted angle. And even when sitting in front of the screen in an ideal position, the illumination of the black bar above and below the picture varies in movies. 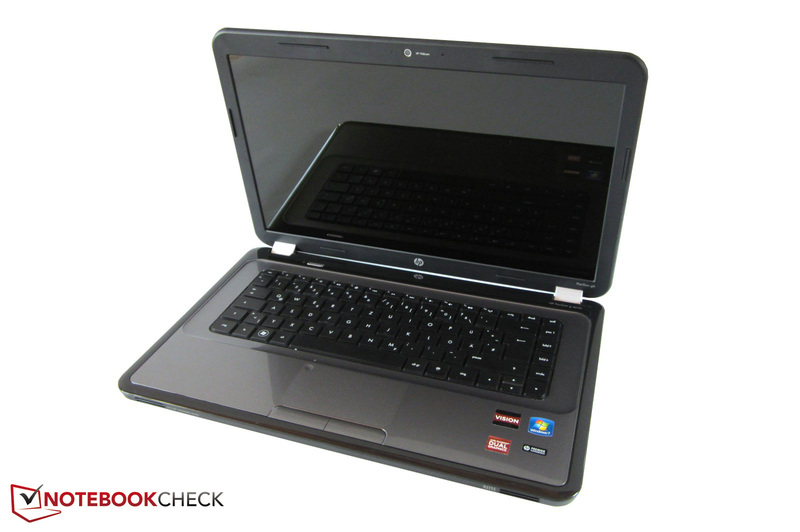 To be able to offer the Pavilion g6-1352eg for a low a price as possible, HP uses a low-end dual core model from AMD. The A4-3305M is codenamed Llano, is manufactured in a 32 nm process and is - despite one billion transistors - one of the weakest CPUs currently available on the market. Clock rates of 1.9-2.5 GHz are fairly slow compared with Intel's Sandy Bridge models. For example, the popular Core i5-2430M runs with 2.4-3.0 GHz. Moreover, it has a small L2 cache. Unlike the more expensive A4 models, the A4-3305M only has 1024 rather than 2048 KB. Intel's Sandy Bridge generation is equipped with a three to eight MB L3 cache. The TDP of 35 watts are acceptable considering that the A4-3305M contains the memory controller and an integrated graphics chip (Radeon HD 6480G). The dual core can also be called APU (accelerated processing unit) due to the amount of components. Automatic overclocking proved to be completely useless. The test device only achieved the maximum 2.5 GHz in idle mode; it was always 1.9 GHz during load. Intel's Turbo Boost technology is far more superior to the AMD counterpart. For one thing, the Sandy Bridge models overclock gradually and for another, the clock is also increased when several cores are loaded. 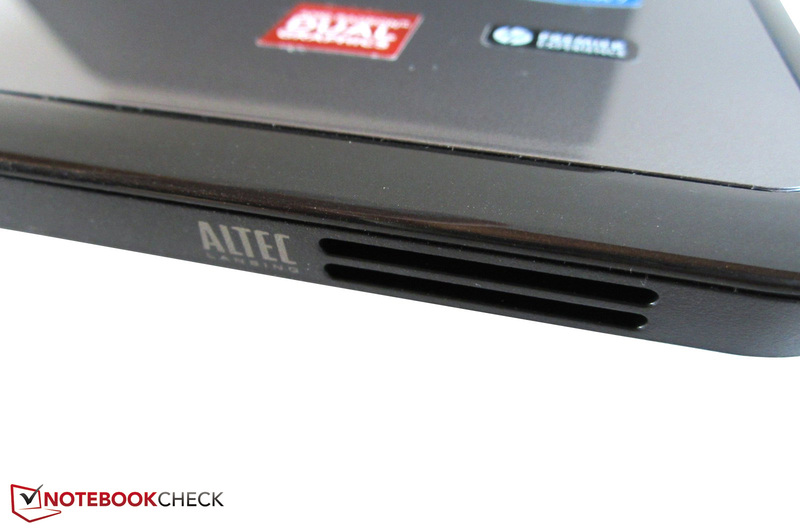 Due to the low clock frequency and the small L2 cache, the performance is also rather moderate. 2293 points in the single core rendering of Cinebench R10 are marginally higher than the quad core model A6-3420M (2199 points @ HP Pavilion g7-1353eg), but far lower than the Intel contender, Core i3-2310M (3458 points @ Dell Inspiron 15R). The situation is even worse in multi core rendering. With 4340 points, the A4-3305M lags behind the A6-3420M (6952 points) by approximately 38% and behind the Core i3-2310M (7531 points) by about 42%. A certain difference to other multimedia devices can be noticed in daily use. 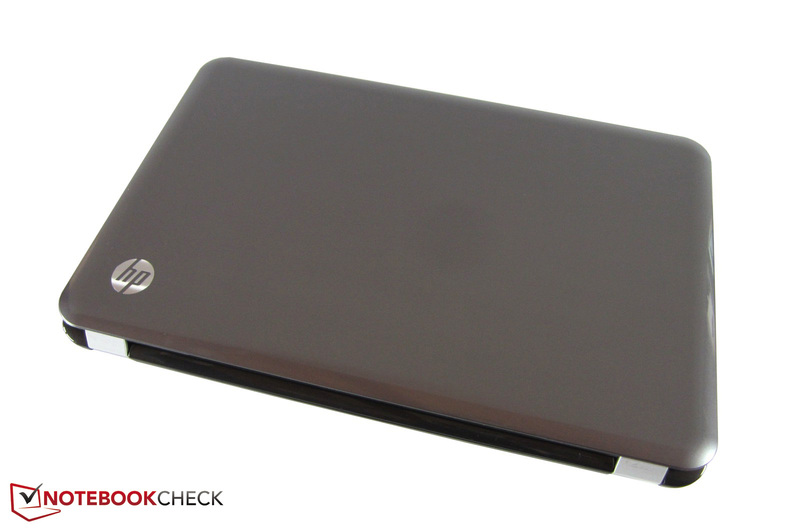 The notebook often seems pretty lame despite the good HDD and six GB of DDR3 RAM. HP clearly stands out from the masses in terms of graphics card and combines a Radeon HD 6480G with a Radeon HD 7450M (= dual graphics). Like Intel's HD Graphics 3000, the HD 6480G, integrated in the processor, is a bit weak. In contrast to the other A4 models, the shader count has been reduced from 240 to 160. In return, the GPU has an about 33% higher clock (593 rather than 444 MHz). The HD 6480G unfortunately doesn't have a dedicated video memory. In the meantime, the Radeon HD 7450M is a dedicated entry-level graphics card that is based on the Seymour chip (40 nm) and, alike the HD 6480G, it is equipped with 160 stream processors. The core clock is 700 MHz and the memory clock is 900 MHz. 1024 MB of DDR3 VRAM also sounds good, if it weren't for the narrow 64 bit interface. A DDR3-VRAM should at least have a 128 bit bus in order to prevent bottlenecks. However, everything that is important is on board in terms of features: Both graphics cards support DirectX 11 and can decode high definition videos. But what good are two graphics cards? While many manufacturers only use the integrated GPU for energy saving purposes, HP goes a step further. AMD's CrossFire technology bundles the available power and lets both graphics cards run simultaneously. This improves the performance in some applications noticeably. However, enabled CrossFire can also cause the opposite effect. The performance is often poorer than with a single GPU especially in DirectX 9 tracks. Another problem is the unpleasant micro-stuttering. The underlying AFR method (both graphics cards take care of image calculation alternately) partly causes varying frame intervals. The result: Games seem to stutter more than the frame rate would suggest. Basically, CrossFire is hardly worthwhile; a single graphics card usually renders smoother. Current DirectX 10 and DirectX 11 benchmarks relentlessly show the multimedia laptop its limits. The dual GPU only achieves 11.4 fps in the Unigine Heaven 2.1 benchmarks when 1280x1024 pixels, high details and default tessellation are used. Low-end graphics card normally stay below 10 fps here. The Samsung 300V3A-SO2DE, equipped with a GeForce GT 520M, only accomplished 7.7 frames per second. The notebook also distances itself from the entry-level range in 3DMark 11 (1280x720, performance preset). With a GPU score of 977 points, the CrossFire configuration is approximately on a par with the GeForce GT 550M (891 points @ Asus N53SN-SX091V). 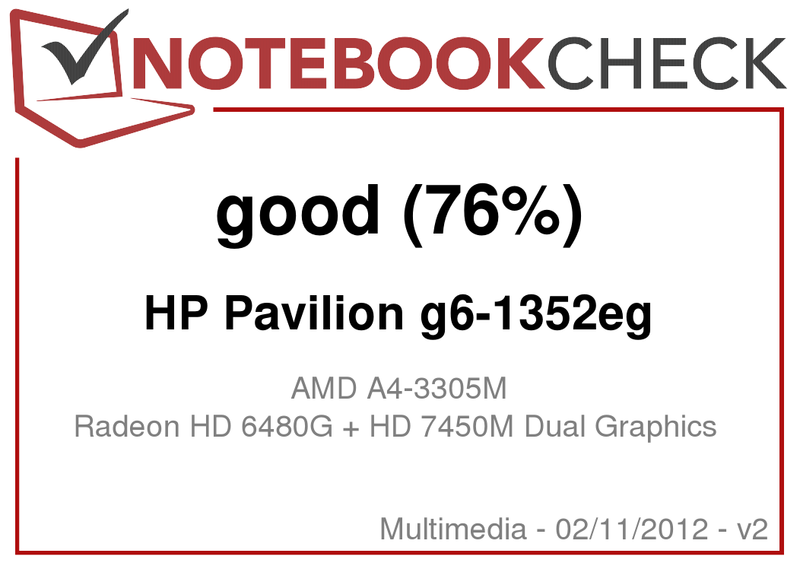 However, the Pavilion g6-1352eg has to depart from the midrange as soon as it is faced with older DirectX 9 benchmarks. 4786 points in 3DMark 06 likely won't impress anyone. 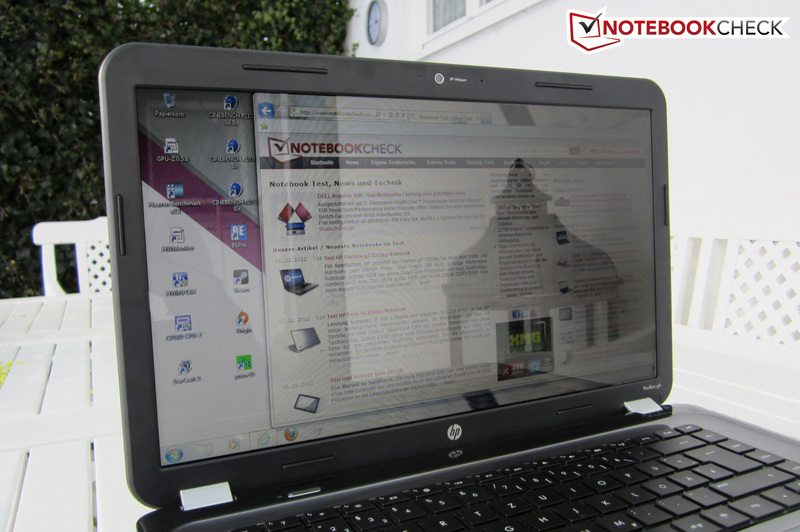 The one or other notebook achieves a higher result even without a dedicated graphics card. An example? 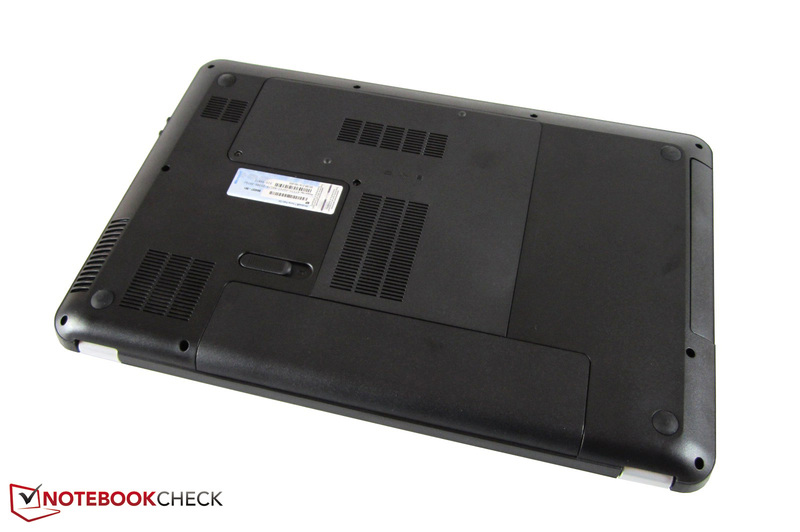 Dell's Latitude E6320 (Core i7-2620M & HD Graphics 3000) managed 4815 points in the test. A 500 GB, 2.5 inch HDD hard disk works inside. Samsung's SpinPoint M8 (HN-M500MBB) has a height of 9.5 millimeters and runs with 5400 revolutions per minute. The performance is definitely impressive for a 5400 rpm model. The transfer speed is between 80 and 90 MB/s depending on the tool. In comparison: Low-end HDDs often have to content with 60-70 MB/s. The average access rate is also good (18.3 ms). The "average" user will likely be happy with the HDD. However, power users, with intentions of extensive multitasking use, will need a faster 7200 model or a solid state drive right away. 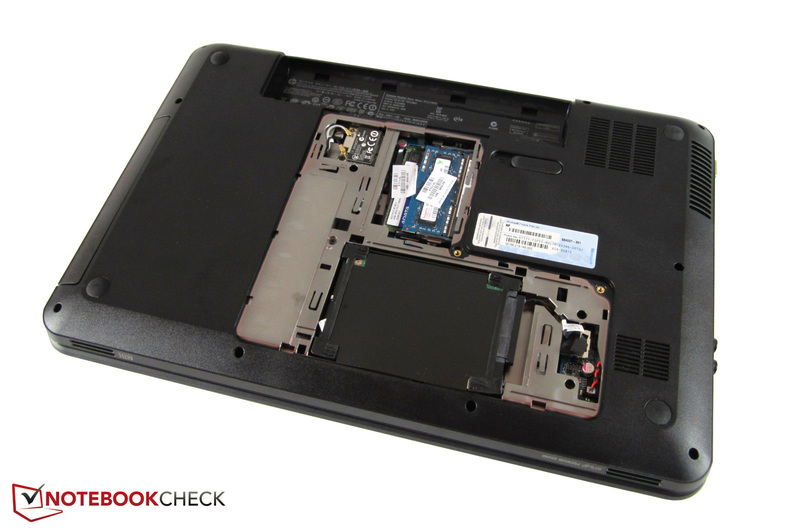 The system benchmarks make it very evident that the Pavilion g6-1352eg is located in the entry-level field. Many devices only have a weary smile for a PCMark 11 score of 1313 points. 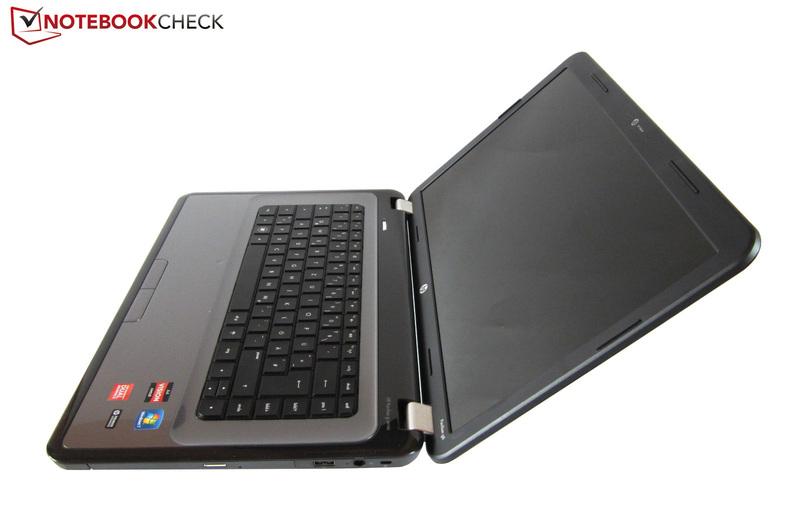 Typical midrange notebooks, such as the Packard Bell EasyNote TS13HR-197GE (Core i5-2450M & GeForce GT 630M), easily surpass the HP device by 50%. 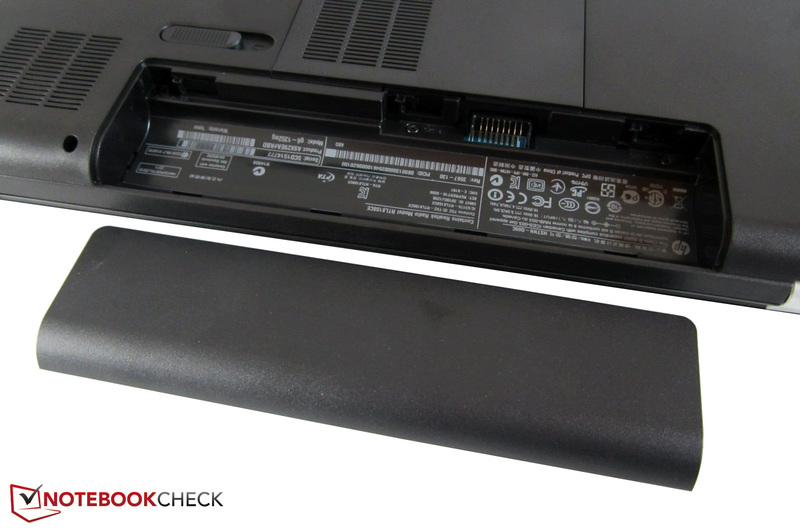 There are more powerful alternatives in the EUR 500 range available (e. g. the Lenovo G770 M533PGE). The 15 inch laptop isn't really suitable for up-to-date games. Most tracks can only be played in low or medium details, because CrossFire rarely provides a benefit and the user is often troubled by micro-stuttering. Some shooter highlights (e. g. Battlefield 3 or Crysis 2) shouldn't even be considered. Even antialiasing isn't always possible. Casual gamers, who occasionally want to try out a new game, won't be happy with the Pavilion g6-1352eg in the long run. The problems might be caused by the preinstalled driver version 8.900.7.1000. First an important note: The option "Fan always on" should by all means be disabled in the BIOS under "System Configuration" (press Esc and F10 while booting). The fan frequently remains inactive in idle when this function is disabled. Then only an unobtrusive hard disk noise is heard that isn't at all annoying. Great: The noise level only increases marginally during load. Thanks to the moderate fan speed, quieter game scenes aren't drowned out, either. In return, the DVD burner's noise development isn't quite as ideal. While a running movie is accompanied by an acceptable whir, the drive hums extremely when data is being accessed. Overall, the Pavilion g6-1352eg nevertheless does a good job; many multimedia devices are noticeably louder. Although the fan runs at a rather leisurely pace, the notebook is always pleasantly cool. The case's temperatures are significantly below that of a standard notebook both in idle mode (~20°C) and during load (~26°C). The components also don't get particularly warm. The processor and graphics card climbed to a maximum of 77°C in the stress test (Furmark + Prime) - an excellent rate. Other multimedia devices tend to reach over 80 or even 90°C here. Great: We didn't notice throttling; the dual core always ran with at least 1.9 GHz. (+) The average temperature for the upper side under maximal load is 25 °C / 77 F, compared to the average of 30.9 °C / 88 F for the devices in the class Multimedia. (+) The maximum temperature on the upper side is 30.6 °C / 87 F, compared to the average of 36.5 °C / 98 F, ranging from 21.1 to 71 °C for the class Multimedia. (+) In idle usage, the average temperature for the upper side is 19.9 °C / 68 F, compared to the device average of 30.9 °C / 88 F.
(+) The palmrests and touchpad are cooler than skin temperature with a maximum of 21.5 °C / 70.7 F and are therefore cool to the touch. (+) The average temperature of the palmrest area of similar devices was 29.1 °C / 84.4 F (+7.6 °C / 13.7 F). The sound quality isn't exactly worthy of reference. 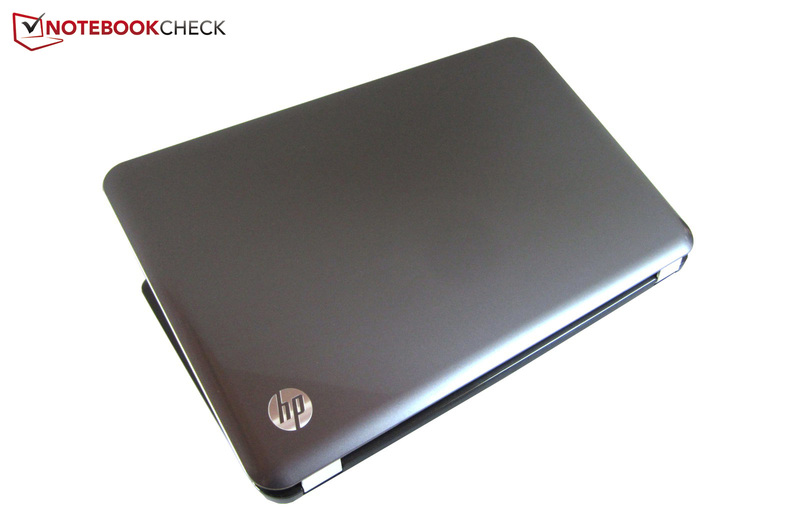 Although HP bestows the notebook with SRS technology and uses speakers from Altec Lansing (2.0 system on the case's front), the sound can only convince to an extent. All media is rendered with a quite tinny and muffled sound and it lacks a saturated bass. Merely the maximum volume doesn't have to accept criticism. But good maximum volume or not: It is recommendable to use external speakers for stationary use. 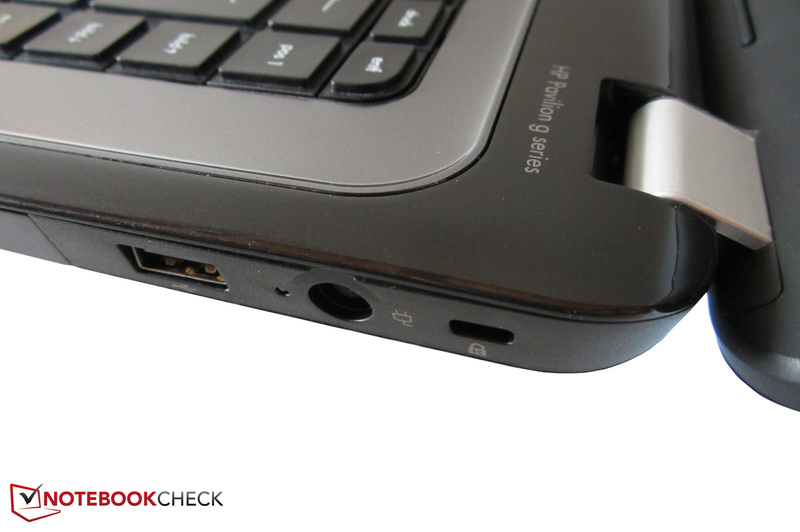 Regrettably, only few devices can score with a really good sound quality (e. g. the Dell XPS 15 or the Asus N55SF). The 15 inch laptop's power consumption is pleasingly low. 9-12 watts in idle mode and 34-46 watt in higher load are evidence for undemanding components and good energy saving mechanisms. Multimedia notebooks usually consume more power. 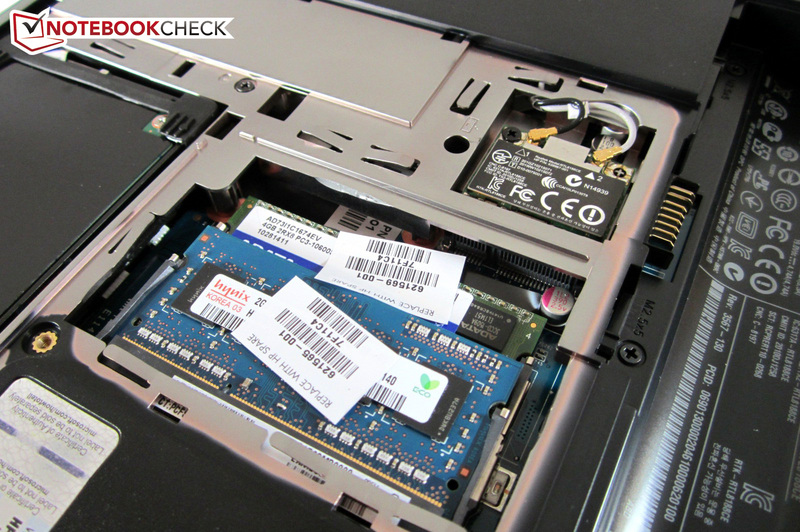 We measured a maximum power consumption of 89 watts in the Acer Aspire 5755G-2678G1TMtks (Core i7-267QM & GeForce GT 630M), so about twice as much. Thanks to the low power consumption, the poor battery capacity (47 Wh) isn't noticed very adversely. Over six hours are possible when the notebook is only put under insignificant load, disabled CrossFire and minimum brightness. Nearly 4.5 hours can be achieved when surfing on the Internet (CrossFire on) with the second highest brightness level. 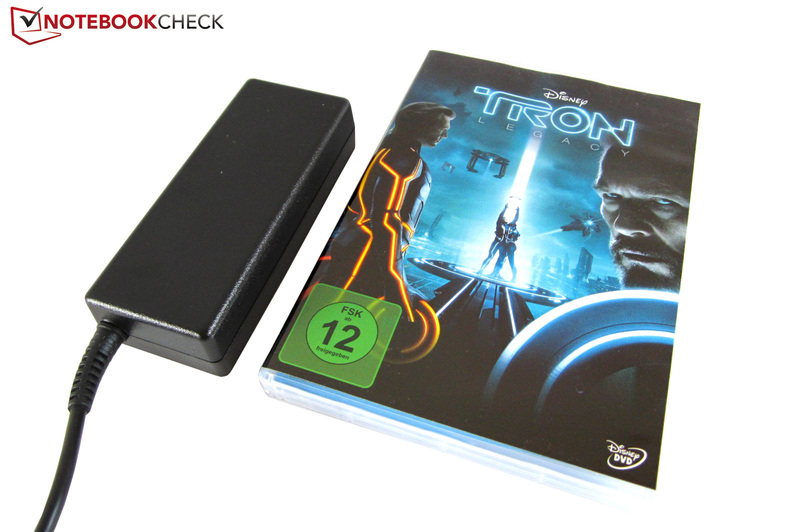 Most movies can be watched to the end; our test DVD was played for two hours and 44 minutes (maximum brightness). The device was drained after only 82 minutes in the hardware-intensive Classic test from BatteryEater. 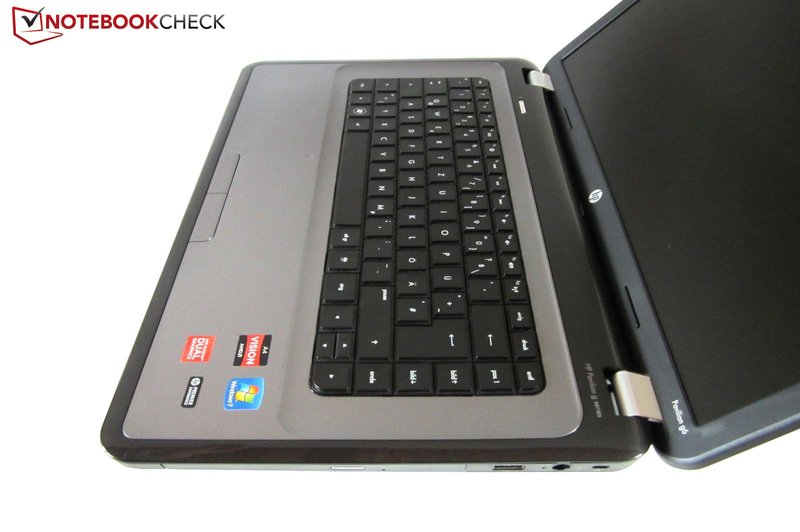 The Pavilion g6-1352eg notebook can't deny that it has been designed for a low price. It starts with the 15 inch plastic case that only sports a few interfaces, a clattery keyboard and a below-average screen. No matter if it's the brightness, black value or viewing angles: The reflective glare screen can't convince in any point. Videos and games sometimes look extremely gray and pale. The performance also lags behind the expectations. Although a dual GPU configuration sounds exciting on paper, the result is occasionally more a pain than pleasure. In addition to the fluctuating performance (the CrossFire configuration is frequently slower than a single GPU in DirectX 9 games), the extreme micro-stuttering is particularly annoying. Hardly a current game really runs smoothly; stutters occasionally turn up even in medium or low details. We would have liked the notebook a lot more with simple graphics switching. But that is enough of complaining. The Pavilion g6-1352eg also has a lot of strengths. 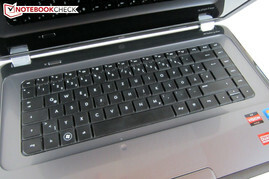 The 15 inch laptop's biggest advantage, compared to other multimedia devices, is that it's surprisingly quiet and cool. The fan pleasantly stays in the background during 3D applications and video files can be enjoyed adequately. 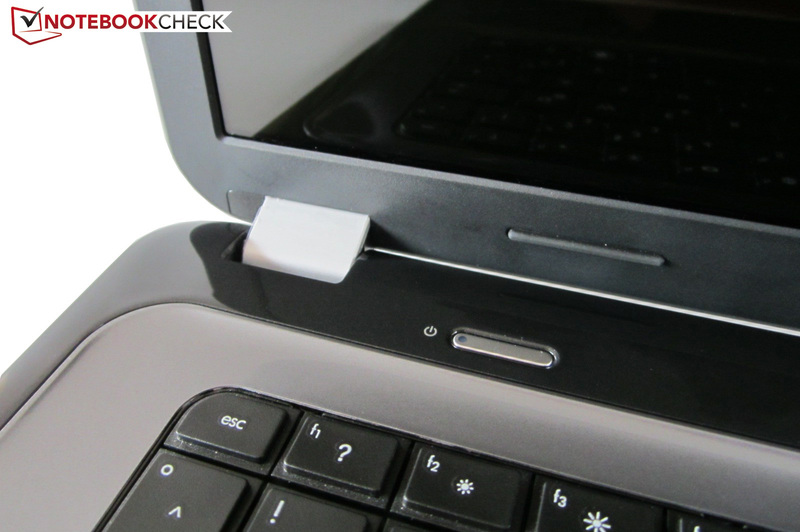 HP also deserves praise for the compact power adapter and the low power consumption. Nevertheless, the all-rounder doesn't receive a general purchase recommendation from us. The Pavilion g6 isn't particularly heavy with a weight of 2.4 kilograms. Two different RAM modules are installed. A 500 GB HDD should prove to be enough for most buyers. 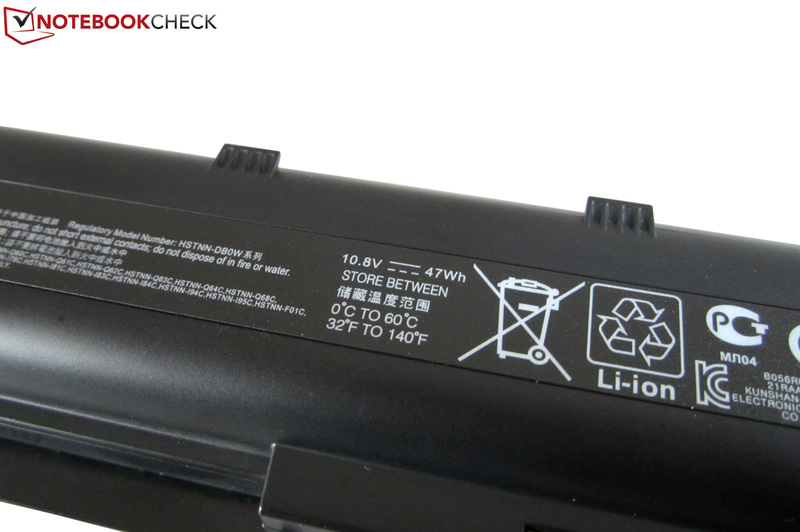 The 6 cell battery is found on the rear. A microphone and webcam belong to the standard program. There is no dedicated number pad. The screen wobbles a bit on vibrating surfaces. The center arrow keys are quite small. The notebook has two graphics cards right away. 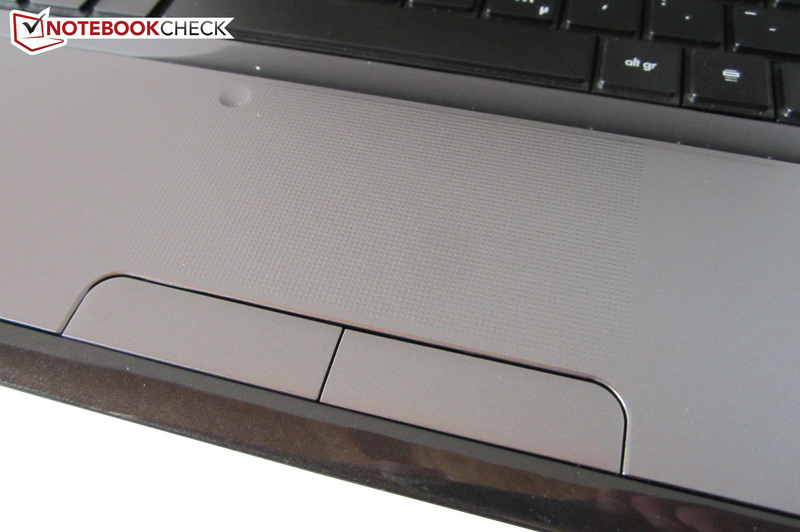 Opinions can vary about the touchpad's dotted texture. 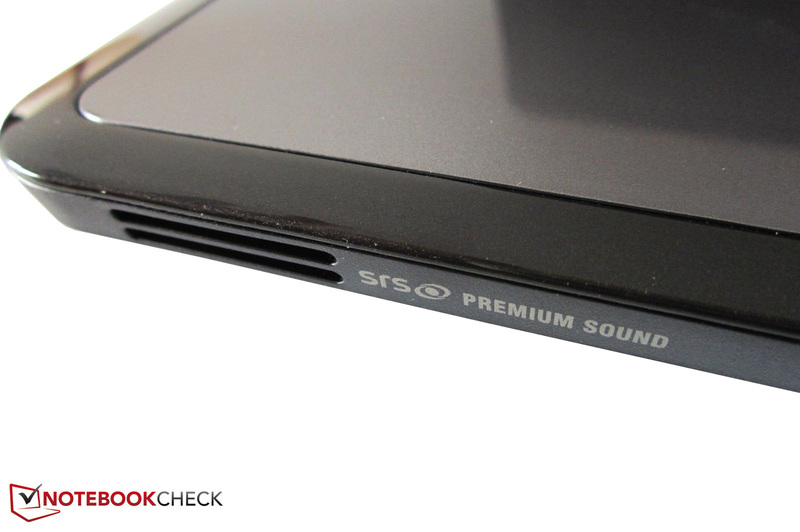 The SRS technology enhances the sound reproduction. Both speakers allegedly come from Altec Lansing. Unfortunately, there is no USB 3.0 available. The integrated card reader only supports two formats. The battery life is in the midfield. 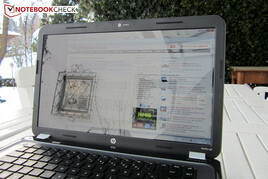 HP only grants a 12 month warranty. Only two screws have to be removed before removing the maintenance cover. The 15 inch glare screen reflects intensely. 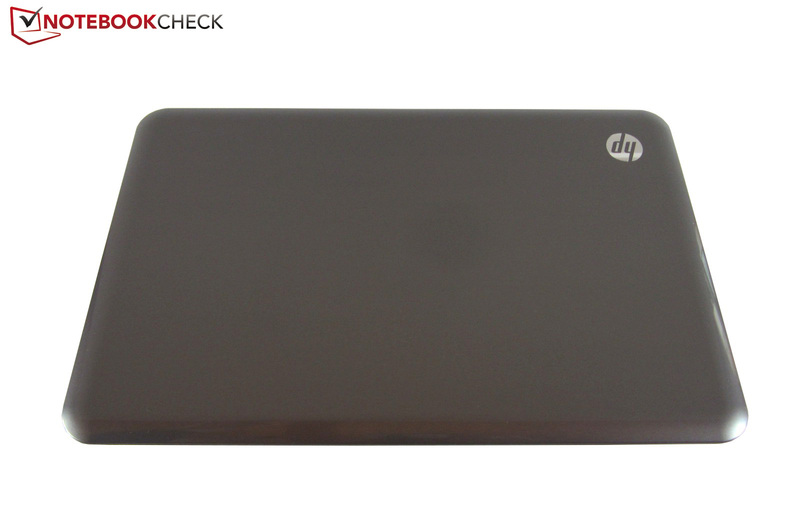 HP has opted for an elegant charcoal gray color. The notebook is made of plastic. A black bezel frames the bright keyboard surrounding. The base unit lifts up evidently when the device is opened. The maximum opening angle is approximately 140° - an average rate. There is a small HP logo on the lid. The keyboard isn't exactly a sensation. Like most multimedia devices, the Pavilion g6 remains under a height of four centimeters. It's fairly easy to exchange the RAM and hard disk. Workmanship and quality impression are solid. The sensitive high-gloss finish likely won't appeal to everyone. Most interfaces are located on the left. A conventional DVD burner is used as the drive. The power adapter is moderately sized. The buyer gets good hardware equipment for EUR 500. 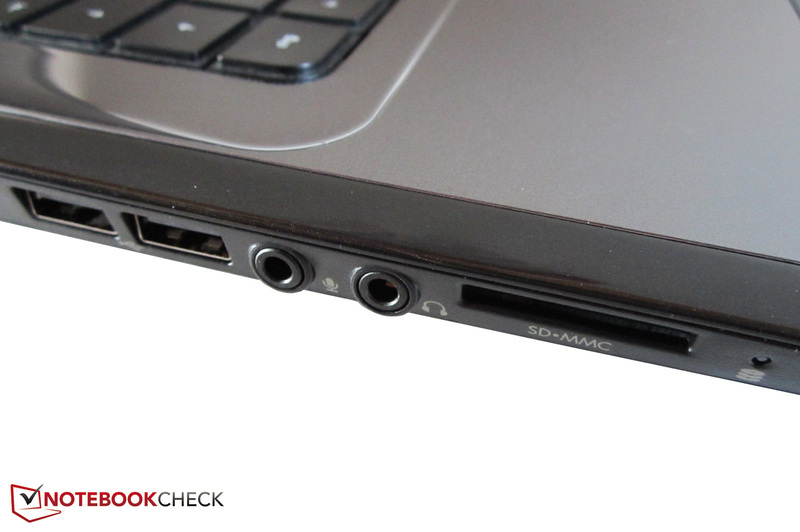 A better developed CrossFire technology without annoying micro-stuttering. The low temperature and noise development. 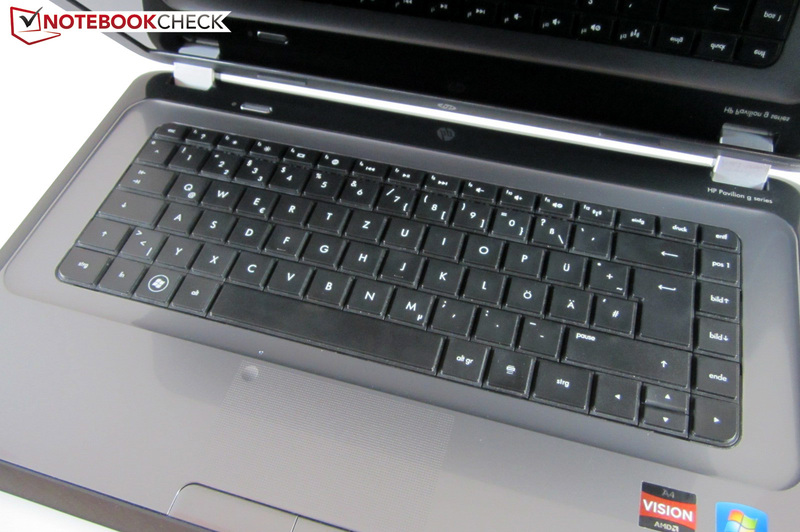 Attractively priced 15 inch devices, such as the Acer Aspire 5560G-8358G50Mnkk, the Dell Vostro 3555 or the Packard Bell EasyNote TS13HR-197GE.